Creative people like you and me have this thing for taking furniture when it’s offered to us and hoarding it until the perfect opportunity to pull it from the dungeons of our furniture stash (otherwise known as THE GARAGE) for a beautiful makeover! This is exactly what happened to me and this ugly dresser. It sat in my mother-in-law’s house for eons, mostly taking up space, until I swiped it. I had no idea when and where I would use it, but I knew it could be beautiful! It started in such bad shape, especially the damaged top! It has really pretty feet, though! 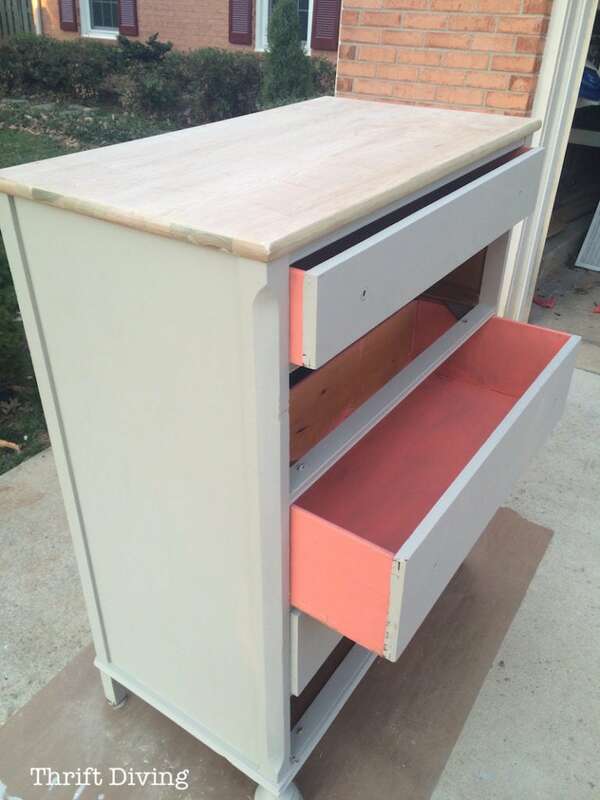 I used Shabby Paints Cali Taupe and Coral Paradise. I didn’t plan on sanding and re-staining the top. But that’s usually how my projects work: I get started, then something inspires me, and I go in another direction. That’s what so awesome about DIY! I use my Ryobi orbital sander for smoothing out surfaces. 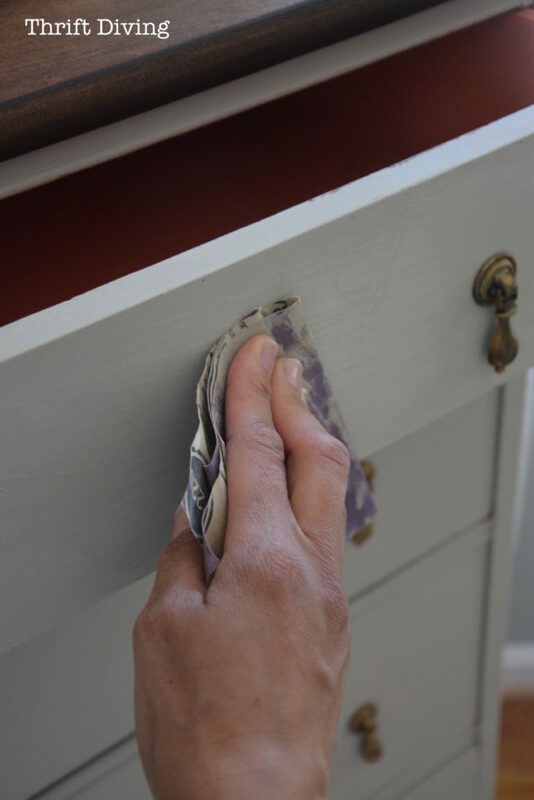 If you’ve got a small surface like a dresser top, using an orbital sander is definitely an alternative to stripping it with chemical stripper. Just make sure to use a 3M respirator mask like this one, and not the little paper one! (FYI: This respirator will also block odors from spray paint, too! I hate spray paint smells!). Look at that fresh and clean top! I love Rub n’ Buff for changing the color of hardware. When it’s tarnished and you want something a little more “cleaned up” or to change the color to a golden color instead of tarnished, or to give it some depth, Rub n’ Buff is a great option. I decided to keep the original hardware. I loved the teardrop shape. 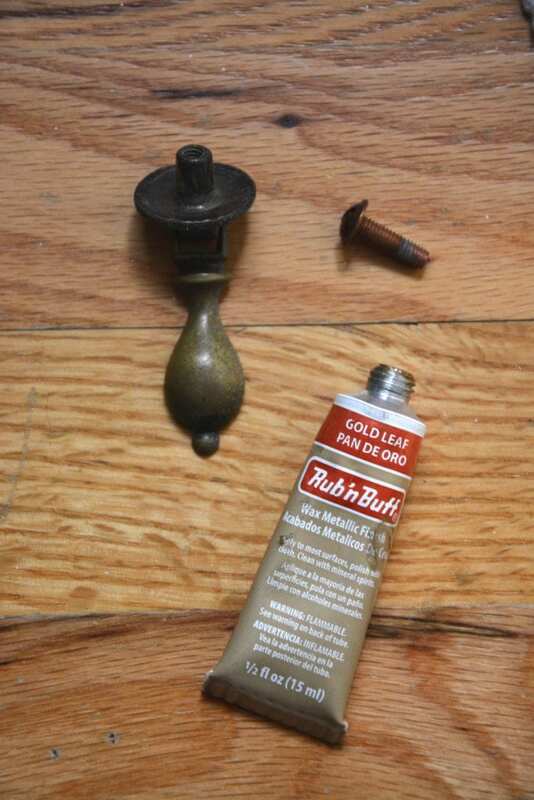 (See just how Rub n’ Buff can change hardware and how it’s awesome with crafts). I used a foam brush to apply stain (can’t remember the color!–just whatever I had on hand), and then wiped off the stain with a lint-free cloth. 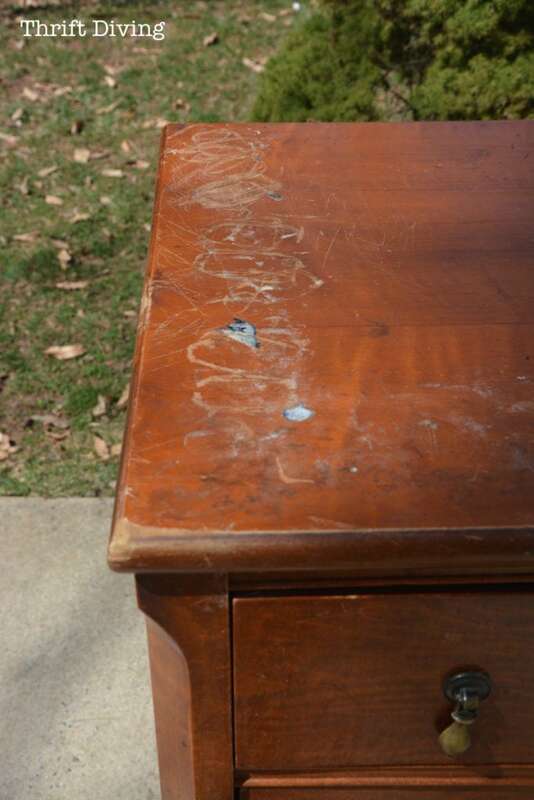 Watch my video on how to strip and stain furniture. Have you ever rescued something ugly lately and brought it back to life? Tell me all about it in the comments section! 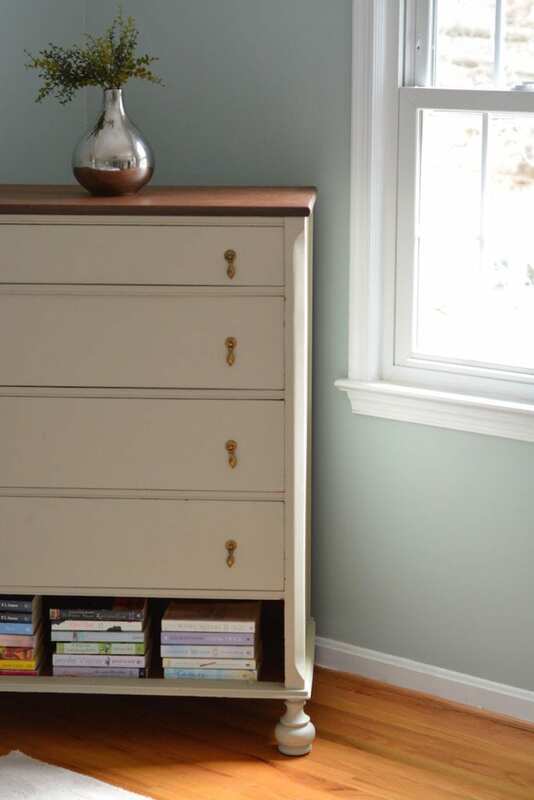 « BEFORE & AFTER: My Pretty Master Bedroom Makeover! Was going to tell you (in case you didn’t know) that you could clean up brass by soaking it in white vinegar and it more-or-less cleans it and makes it a little bit more like it’s a ‘brushed’ finish. 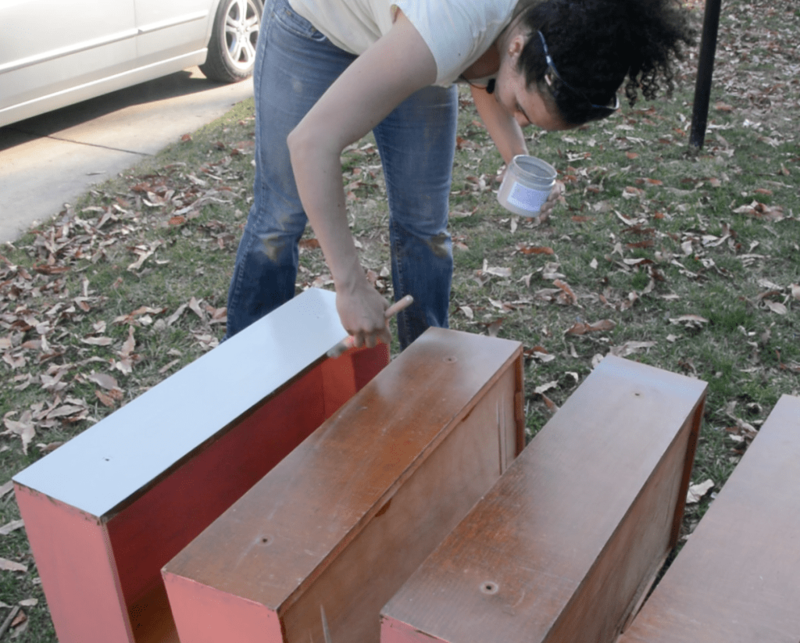 And then if you don’t want the pulls to turn you can spray them after you’ve cleaned them up with a spray clearcoat. I just leave mine since it takes awhile for them to tarnish again. 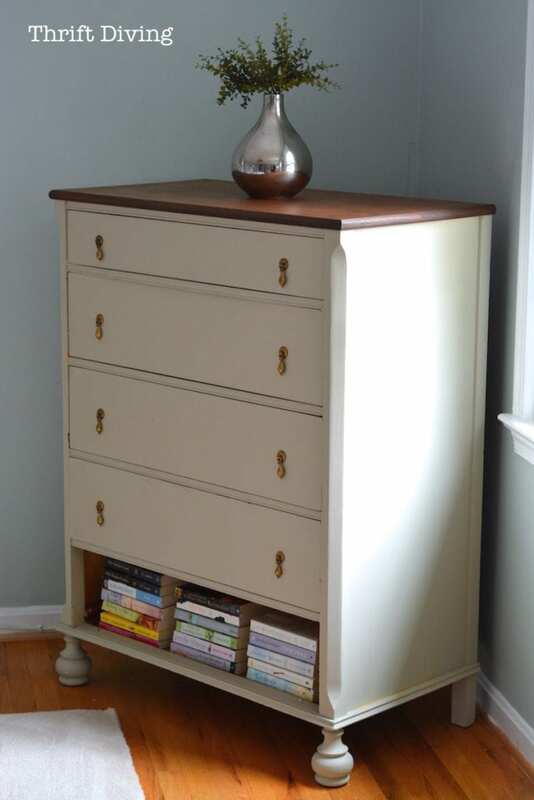 Another neat idea is to just brush some white paint on them and then wipe it off so that the detail on the pulls (or knobs) then is enhanced. 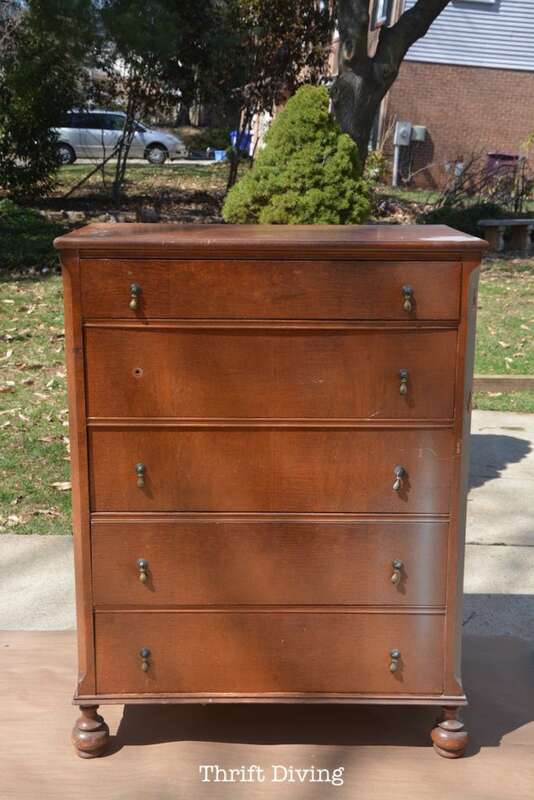 Your dresser turned out beautiful. Loved that you left it stained on the top too! I always love a good furniture makeover. 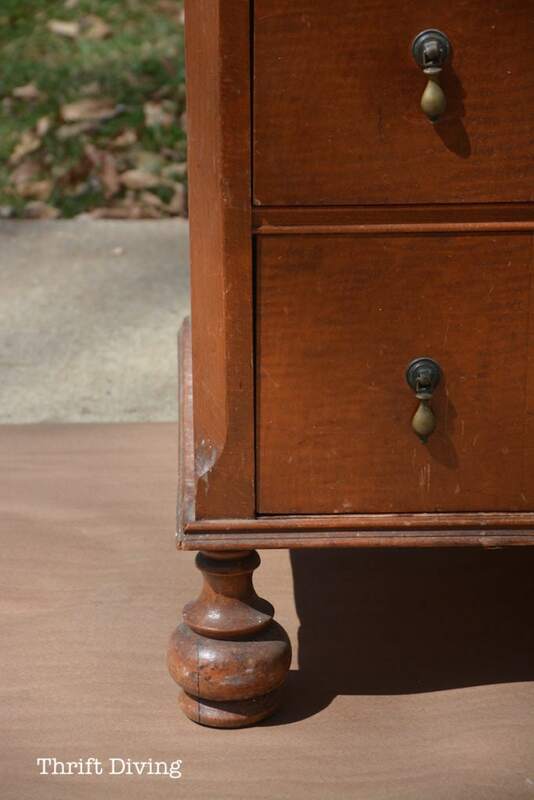 I never tire of seeing how you can take a tired piece of furniture and restore its beauty with paint. 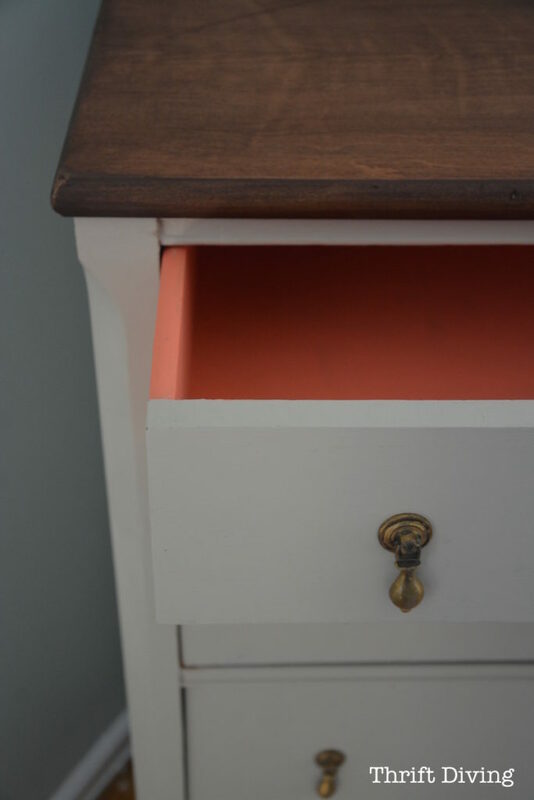 I love the pop of color of the drawers. 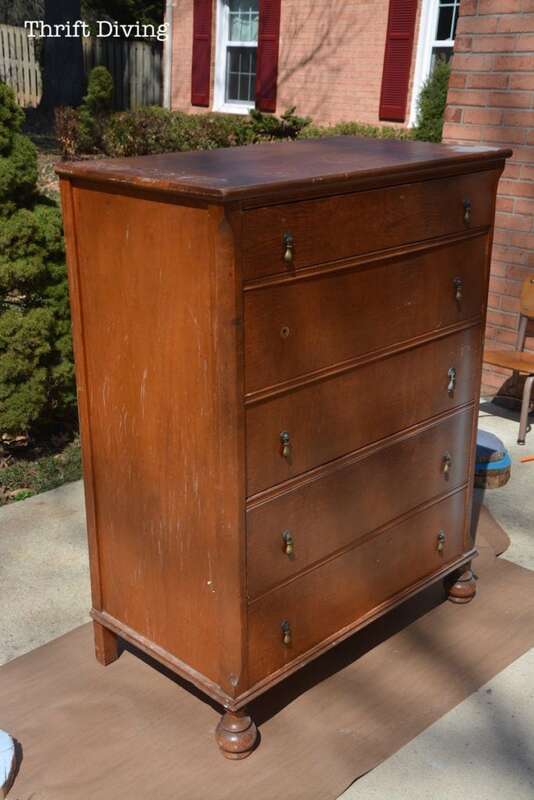 The dresser is so lovely. drawer out. You really work magic on furniture. Awesome job!! You’re a furniture miracle worker. 😀 It looks so proud of how fresh and new looking it is afterwards! I was wondering where you got the new knob, though? 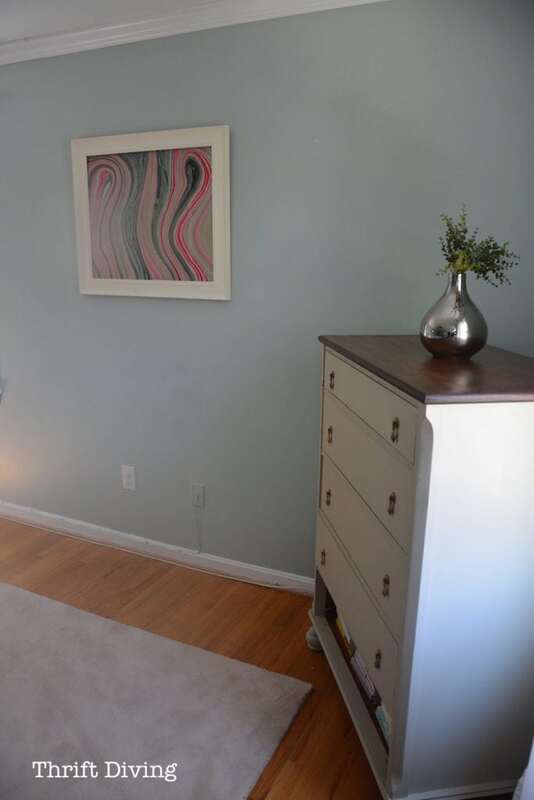 It looks like a perfect match to the others, and it looked like you were missing a knob from the before pics? I think it’s because there is one dresser I didn’t use and just left the bottom out. So I had an extra knob! white isn’t usually my favorite, to many years living in apartment white walls.. but I love this, and the coral is such a wonderful bonus. Lovely job Serena, thanks for the how-tos! 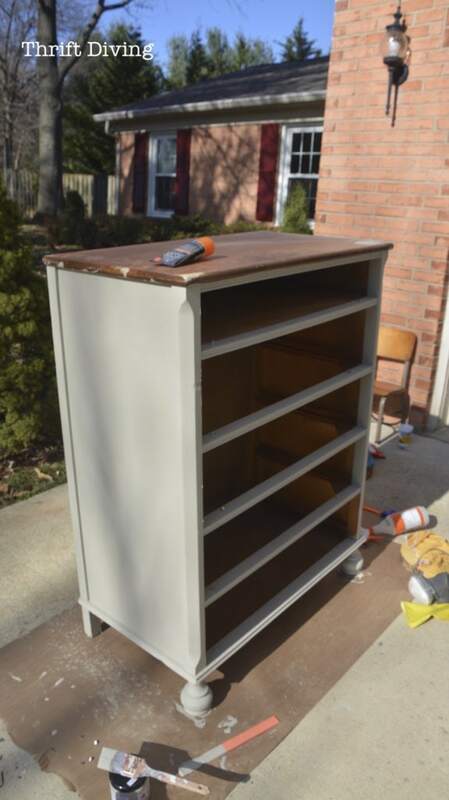 Do you have any tricks to get the wood filler to blend with the color of stain? I find the spots end up blotchy and ruin the look. Still trying to even out a table top I’m doing. Hey there, Tracy! So funny you should ask this question. I saw someone asking this on Facebook the other day. I also run into this problem. Some people were saying that when they sand it out, they’ll leave some of the dust in the area where they used the wood filler. I think someone else mentioned filling the hole with sawdust. But honestly, I haven’t tried any of these methods, so I can’t verify them. I think I will experiment with it and see if I can come up with a solution that looks good, then I’ll do a post on it! Be looking out for that, okay?